The Las Vegas Wonderground is arguably one of the most entertaining events hosted in the area each month. This November was the first time I had the pleasure of participating in the event and I loved every minute of it! Designing and creating four balloon dresses for the show was only part of the fun; the evening had a spectacular energy about it and I got to meet some incredibly talented performers! Created by the highly acclaimed magician and performer, Jeff McBride, Wonderground brings together the magic and variety communities, and results in an extraordinary combination of co-created art performances. The event is hosted every third Thursday of every month at The Olive, Las Vegas, NV (a Mediterranean restaurant). The four hour experience is hosted by Jeff McBride himself and features a wide range of local artists, as well as numerous world class performers! Anyone interested in the world of mystery, variety, performance art and/or magic, is bound to have a thoroughly entertaining night! There’s also a bit of a nightclub experience to the whole thing which just adds even more excitement to the evening and puts everyone in good spirits! Air: The dress that represented the element of Air was worn by Ronnie Garr. On this dress, I used a combination of white and silver balloons that were more sparsely spaced at the bottom to add a bit of an airy and cloud-like feel to the piece! 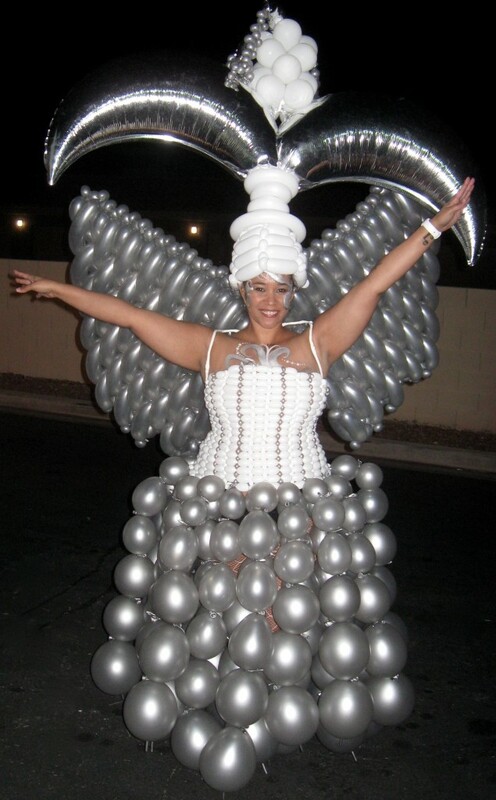 The dress included a pair of large silver wings and a massive silver headpiece. 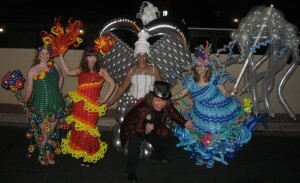 Water: Julie Sparks modelled the dress that represented the Water element. The balloons used for the main body of the dress were predominantly different shades of light and dark blue. 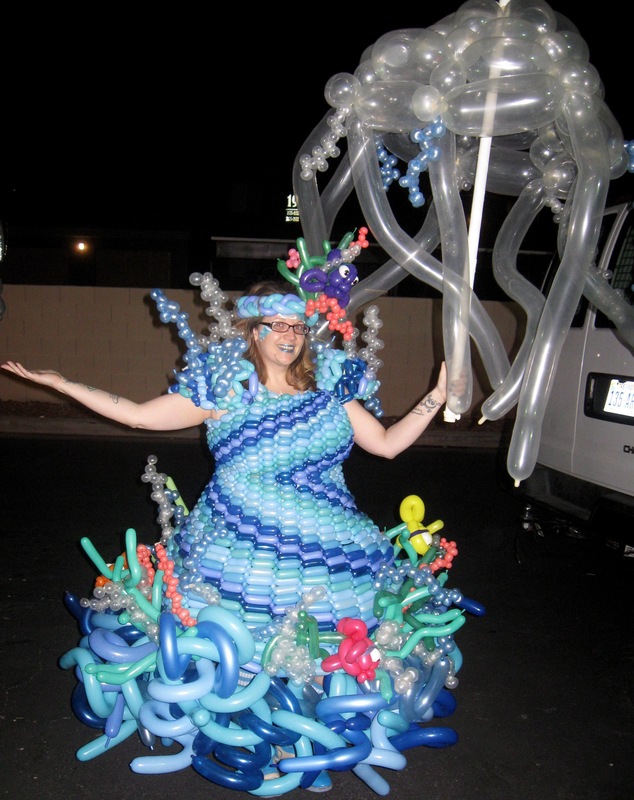 The dress also featured a variety of colourful sea creatures and plants, both at the bottom of the dress (where longer balloons were used to re-create the movement of water in waves), as well as on the headdress. 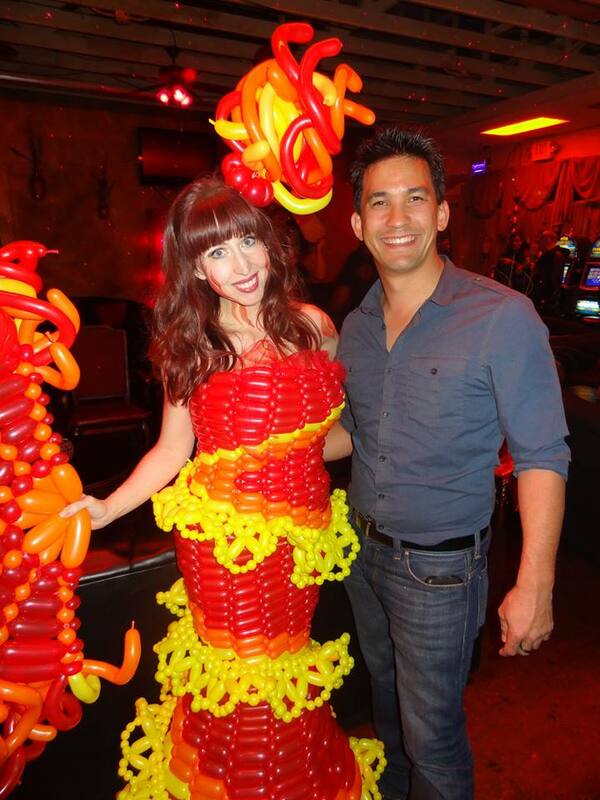 Fire: The element of fire was represented by an elegant red balloon dress with orange and yellow balloon lace that added a rather sultry feel to the piece. Jamie Strickland Diaz wore the dress to perfection! The dress was accompanied by several accessories, including a large balloon fan and an elegant little headpiece. 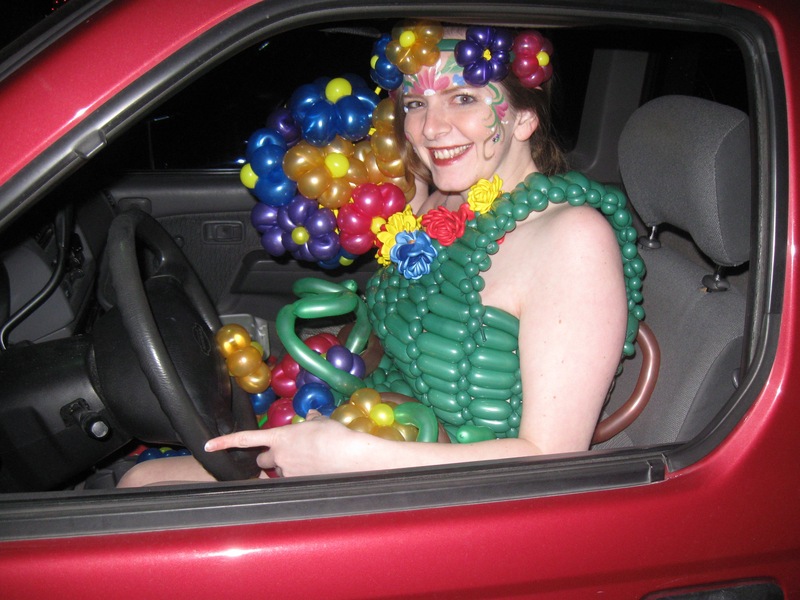 Earth: Erika Comparoni fell in love with her Earth inspired balloon dress – so much so that she didn’t want to take it off, she even drove home in it! This dress was the shortest of the four; instead of going all the way down to the floor, it was a rather short balloon dress with a skirt made out of balloon flowers! 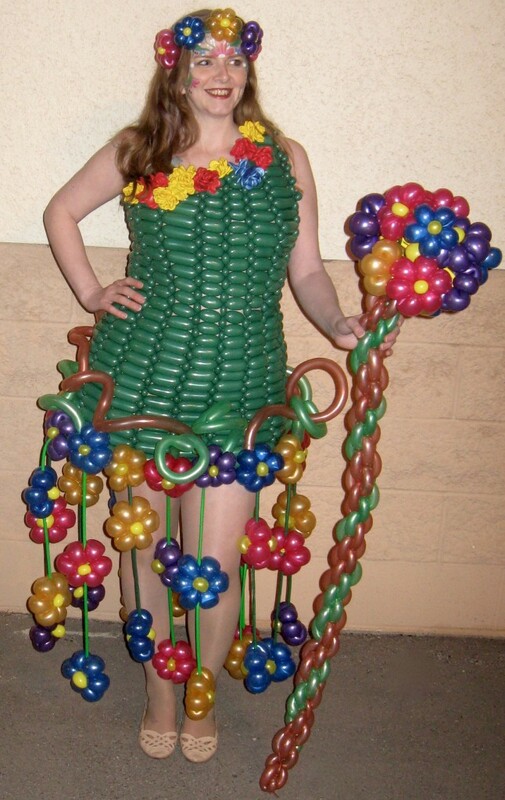 The green dress featured brightly coloured balloon flowers, a bright balloon headband and a large flower staff! 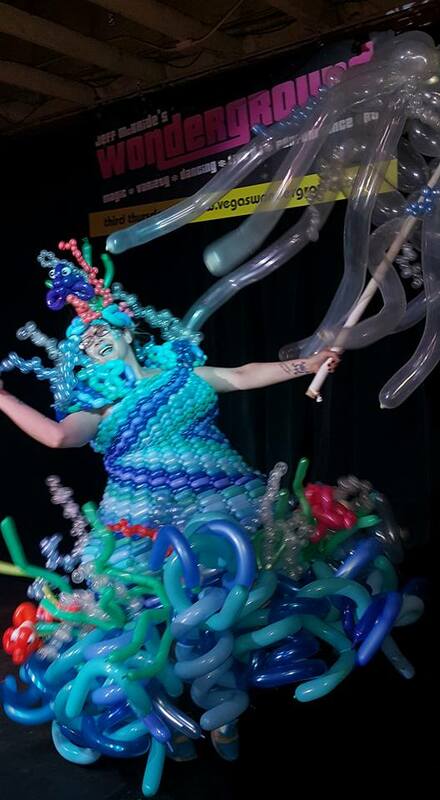 I have to give a big thank you to all the models who wore the dresses so brilliantly, as well as special thanks to Erika Comparoni, a fellow balloon artist, who helped in the creation of the balloon pieces! The outfits would not have been complete without the wonderful work of make-up artist Angela Graan, who really pulled the different looks together with her additional work on the models! I had a fabulous time at the event! The balloon dresses truly stood out from the crowd and added to the magical/mystical atmosphere of the night – what is it about balloons that gets people to loosen up and have a such a great time? !